It's the middle of winter, so you never know when you might need a little more grip in your step to ward off ice-related injuries. (Well, here in Sacramento it's never, but that's just me...) In any case, here's a quasi-useful idea for that kind of situation: boots with built-in reversible cleats. Sure, the boots are highly specialized and expensive - but in exchange, the cleats are always available and don't have to be stashed separately when not in use. 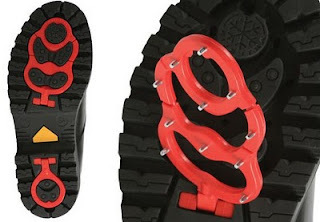 It's a neat idea, and would be especially so if there were some standardization for shoe-tread attachments across footwear manufacturers. As is, the fact that they're available from Hammacher Schlemmer kind of undermines their credibility! But who would want to touch the bottom of their shoes after walking through ice and snow to flip them back when you get inside? Not only would you freeze your fingers, but they'd be covered in sand and salt and whatever else was on the sidewalk or parking lot. You can buy relatively inexpensive elastic cords with metal grips to pull over your shoes to do the same thing. You can pull those off without getting your hands dirty, and they fit ANY shoe. A very good point, Bailey, and that's exactly the competition these are up against - and the option I would probably choose myself! But this product offers the one advantage of always always ALWAYS being on and ready to go. It's not for everyone, but the absent-minded may be thankful!